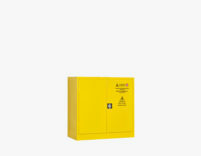 Monoblock cabinet for flammable materials The storage cabinet for flammable products MI 1 is perfect for storing dangerous and flammable substances, guaranteeing operator safety and complying with the regulations in force. It is made of D C 01 / FeP01 UNI EN 10130 material with epoxy-polyester powder paint color RAL 1021. Maximum safety is the indispensable requirement. 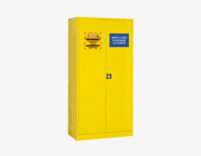 Monoblock cabinet for flammable materials The cabinet for storing flammable products MI 2 is perfect for storing dangerous and flammable substances, guaranteeing operator safety and complying with current regulations. It is made of D C 01 / FeP01 UNI EN 10130 material with epoxy-polyester powder paint color RAL 1021. Maximum safety is the indispensable requirement.